The core of Encore’s National Welding Month celebration is a social media sweepstakes with a grand prize of a $500 Visa gift card, a collectible, limited-edition National Welding Month t-shirt and various other items. Encore is distributing special “tool-box / hard hat” stickers throughout the month of April. In order to be entered into the grand prize drawing participants need to post a photograph of where they stuck their sticker to Facebook, Twitter, Instagram or all three social media services, mentioning @EncoreSupply and using the hash tag, #EncoreNationalWeldingMonth. The grand prize drawing will occur on May 6. A complete list of the official sweepstakes rules can be found on the company’s website, www.EncoreSupply.com/sweepstakes. 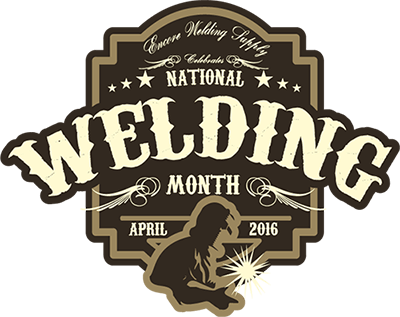 Encore&apos;s National Welding Month celebration is merely the most recent example of the company&apos;s commitment to welders and the welding profession. The company&apos;s vice president and general manager, Paul Anderson, is on the board of directors of the local American Welding Society (AWS) chapter. The company also partners with area welding schools to help students extend their skills and network for job placement.